Kelly understands that every client and each home requires something different in terms of service, marketing, and skills. Her keen awareness of this fact allows her to adapt to the specific circumstances and apply her knowledge of the market and how it works to help clients get the most out of each transaction. Kelly recognizes that there is no "easy button" in this business and provides her clients with the service and expertise they need. With her marketing background she has served her clients well in all facets of the selling and buying process. From building a marketing platform for sellers, to designing a comprehensive buyer’s checklist, clients are assured the best and most efficient buying and/or selling experience. Kelly and her husband Rob have lived in Winnetka for over 30 years and have raised three children. 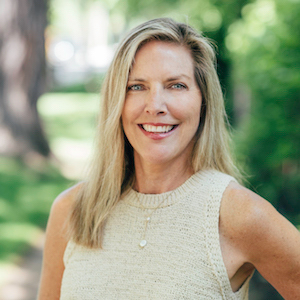 She has served on the Rush Auxiliary board, New Trier Hockey board as well as volunteering as a New Trier Parent Adviser and Cub Scout leader. Kelly continues to use these and other experiences to better serve her customers as they navigate their real estate needs on the North Shore. In Kelly’s free time she enjoys spending time with her family, yoga, spin, renovating her own home and throwing back a tasty craft beer. Skol!